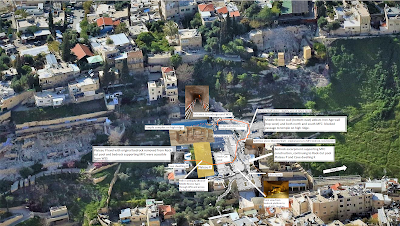 I set out a theory and proof that ancient occupiers of the sparse hills of Jerusalem, with significant help from their regional allies constructed substantial elements of the Massive Fortified Corridor (MFC), adjacent to the Gihon Spring specifically to discourage Israel's return. A conclusive theory of Jerusalem's Middle Bronze (MB) to Iron Age period continues to evade archaeologists and historians. One study by Hillel Geva tracks the development of Jerusalem's population and provides an excellent overview of the areas the city expanded to through the ages. I will use the breadcrumbs of population growth, as found in Middle Bronze age archaeology to reconstruct the first period of the city’s development. Bewildering is the absence of any archaeological trace of a Middle Bronze western city wall in the presence of the MFC adjacent to the Gihon Spring on the eastern slope. Perhaps even more complex is the scant evidence of a complete eastern city wall, one that should have certainly left significant traces at intervals. I will demonstrate that the MFC was not constructed to protect water as per common logic, but to serve another motive. The massive Middle Bronze II (MB II) fortress erected around the Gihon Spring undoubtedly required a major economic effort and substantial manpower (Boas-Vedder 2001; Reich 2011: 248–261). This does not mean that the inhabitants of the city were necessarily the builders of the massive structures; much of the manpower may have been recruited from the hinterland (Geva 2014). Although Uziel lead research to carbon date construction of the north-east corner of the fortress, an MFC extension to the Iron Age 800-900 B.C.E, there remains significant evidence that progression of construction from MBII to completion at the northern end may have occurred in the Iron Age. Israel Finkelstein shares the view that the MBII fortress and area around the Gihon Spring remained somewhat independent of the expanded city. 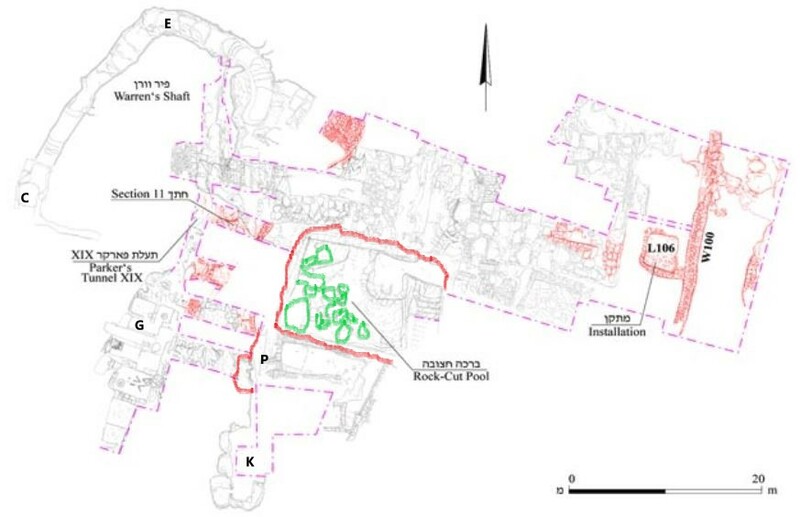 The old mound of Jerusalem was located on the Temple Mount (Ophel) and activity on the City of David ridge (the southeastern hill of Jerusalem) was restricted to the area around the Gihon Spring (Finkelstein, Koch and Lipschits 2011) In other words he supports the view that a complete MB II city wall, which has not yet been discovered, may not have existed at that time. Figure 1 - Middle Bronze II - Warren Shaft System, Fortification and Gihon Spring. To align see (E) in Fig.2 below. This invokes many questions, particularly related to evidence the Parker-Vincent expedition of 1909 uncovered, much of which has been principally ignored by Israel's modern archaeologists. An amateur researcher would be hard pressed to find any archaeological reference to Jerusalem's oldest private cave dwelling, but for a 1909-1911 photo of Parker and Vincent. This photo exposes [K-21-b] on the Vincent map, a private cave dwelling elevated ~20m above the valley floor on the eastern slope of Mount Moriah, south of the Gihon Spring. The cave dwelling (K) dates back to the early bronze age. 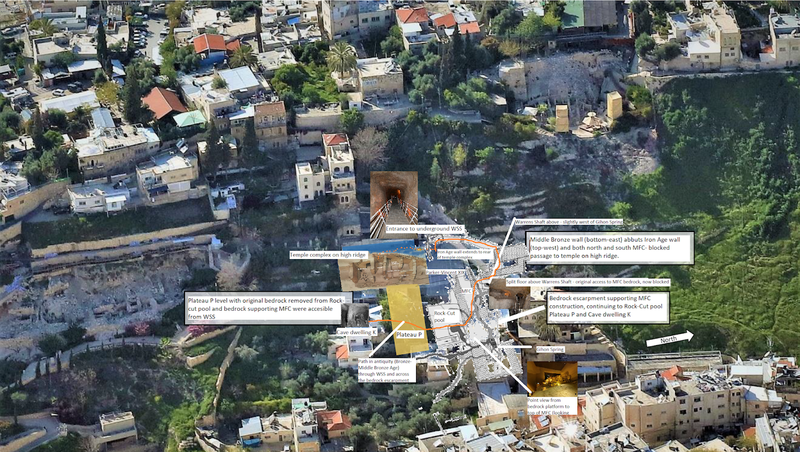 It is barely referenced by Ronny Reich in his recent book Excavating the City of David - Where Jerusalem's History Began. Vincent also discovered pottery and tombs on the mountain that were dated to 3000 B.C.E. None of these finds date later than the Early Bronze Age. 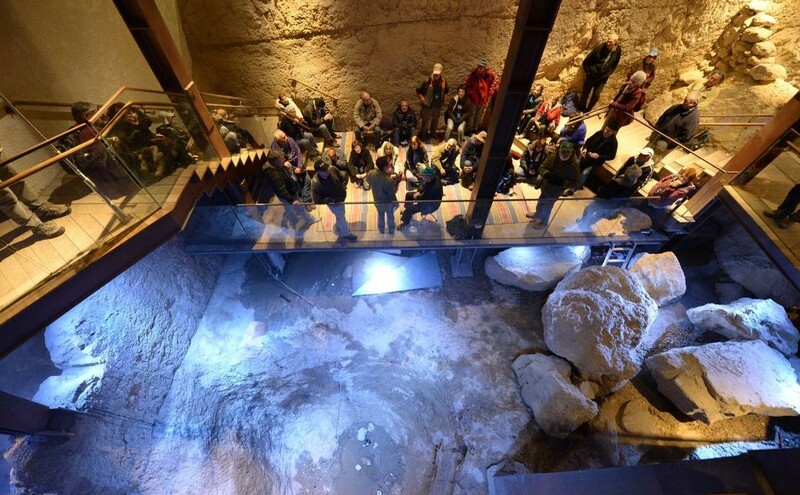 I rely on the hypothesis that this initial private cave dwelling K was developed by and for important occupants because of its substantial size and features relative to the period of its construction. On this and evidence discovered in the immediate areas around this cave dwelling, I reconstructed the progressive development logic of population growth in the area. Parker and Vincent excavated K as well as extensions L, M and passage N, adjacent to the more recently excavated area east of L, K, J and P. This area south of the, Rock-cut Pool(Fig. 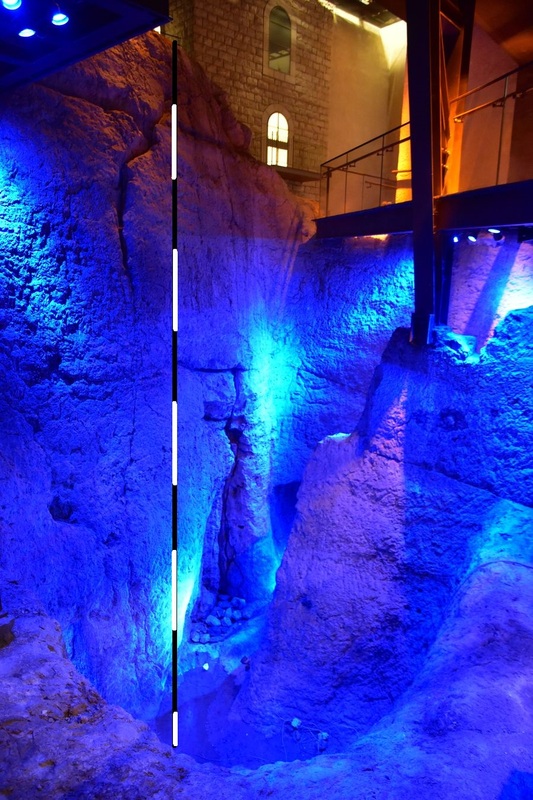 1) forms an elevated platform ~3m above the top step that leads (on its eastern end) into the Round Chamber (within the Rock-Cut Pool) (Fig.1) also marking the lowest part of the expanded Rock-Cut Pool. Figure 3 is a rough context map of the entire complex including important elements missed by the Parker-Vincent excavation. The Middle Bronze age is a critical period in the development of this site, but the areas missed by Parker-Vincent, those (south) adjacent to G were excavated by Shukron in 2008-10. The most recent excavations (the circled area) are fundamental elements in the logic of these staged progressions. 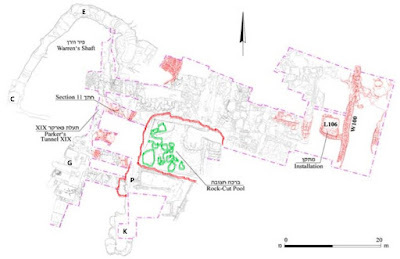 The birds eye view in Figure 3 includes (what was) an impassable access corridor rising from lower elevation J-P to a temple complex on high ridge G-H. 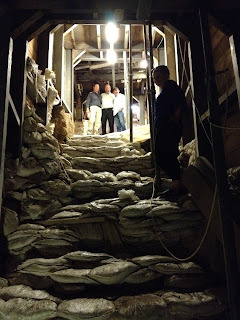 In area F (lower level) excavation reached the bedrock and exposed a number of steep bedrock steps, on several of which were potsherds from Middle Bronze Age IIB. (Shukron, Uziel, Szanton 2013) and Kathleen Kenyon's trench excavation immediately north of Wall 17 revealed potsherds dating to MBII (Reich). Following the logical path from C to E to G (including via external passage at E) a well thought-out plan was implemented to improve upon natural karstic elements and combine them into an accessible water supply system that became known as Warrens Shaft, (Dan Gill). Although the complex of rooms excavated at G were completed by 2011, no archaeologist report has ever been published, but the temple features of this complex overwhelmingly support its spiritual importance. Returning to the Rock-cut pool of Figure 1, the MBII channel and Round Chamber preceded the expansion of the pool to its present day boundaries (Reich attributes this expansion to the Iron Age). The eastern stepped access into the expanded pool and more humble Round Chamber suggests the Chambers original elevation may have once been level with adjacent plateau's north and south (as indicated, by red outlines in Figure 4 below). Looking (south) over the Round Chamber, tourist walkway sunken into Rock-cut Pool. The expansion of the Round Chamber into the Rock-cut pool, which disconnected the lower section of corridor P-G would have rendered the P plateau and cave dwelling K inaccessible from its opposite northern plateau (that supports the remains of MFC - Fig.5). Further, the high ridge of area G would have become inaccessible from any of the lower reaches on the eastern slope of Mount Moriah and the Kidron Valley. This or any renovation may have occurred at a date later than MBII, perhaps very Late Bronze (LB) or Iron Age (IA) (Reich). In the video above Ronny Reich confirms that Middle Bronze Age access to water in the Round Chamber would have been via WSS to the MFC plateau (before the MFC was built). 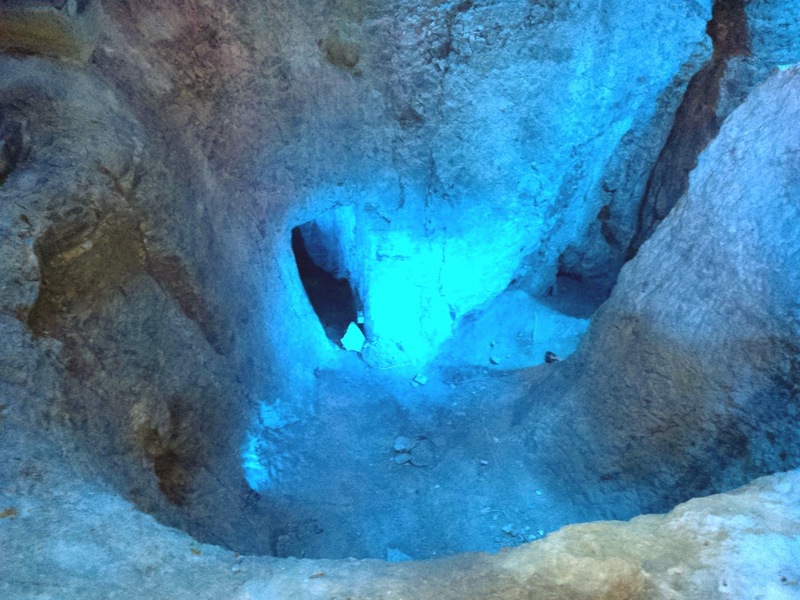 The cave’s opening is sealed but may have been accessible in antiquity (Uziel). At the same level, MFC plateau was level with and part of the P plateau. Quarrying the the Rock-cut pool and construction of MFC would have cut internal access between the WSS and plateau P.
It would have been convenient to quarry and extract the rock surrounding the Round Chamber to form the Rock-cut Pool in order to construct the MFC on its adjacent northern plateau. Was this part of their thinking? The deep chasm of the Rock-cut pool cut access and the added MFC divided the entire mountain to the south placing more emphasis on north-west expansion of the city. This is further evidenced by the existence of wall constructs that blocked access along Parker corridor XIX at the point the fortification corridor abutted city walls that were constructed in the Late Bronze or early Iron Age. Having been slowly established during the Bronze Age on the lower, southern end of the eastern face of Mount Moriah, people, who were now more technically capable were on the move to expand the walls of the city north as the Iron Age was gathering pace. If we accept the hypothesis that this was the pattern by which Jerusalem became more populated then we can understand this atypical development model for a location so prominent in history. Atypical because countless archaeologists who have worked on or studied these excavations coalesce that water protection was the motivation for fortification around the Gihon Spring, but I suggest this was not the case. The effort to quarry the Rock-cut Pool and construct adjacent fortification corridors that cut the eastern slope, separating south from north was herculean (Boas-Vedder 2001 and Reich 2011). Regional labor, at subsidized cost would have been imported to the city, but only if the ~900 inhabitants (Geva) of MB Mount Moriah had good reason to inspire and undertake such significant development. Note: The Rock-cut pool is cut deeper on the southern, northern and western edge. Storing water was not the reason for these deep cuts because the eastern edge, perhaps as much as ~2m lower dictated the highest water level in the pool. Given Dan Gill's observation "...that Coming out of the upper tunnel (Tunnel VI) to the eastern slope, a traveler finds himself outside (to the north) of the MFC rather than on a path leading into it...", protecting water does not seem to have been the objective of the MFC construction. Although Early Bronze developments may have cast the die, at any reasonable MB, LB or IA date, geopolitical objectives must have been strongly aligned to inspire regional powers to support the construction of such a substantial infrastructure push to the north. 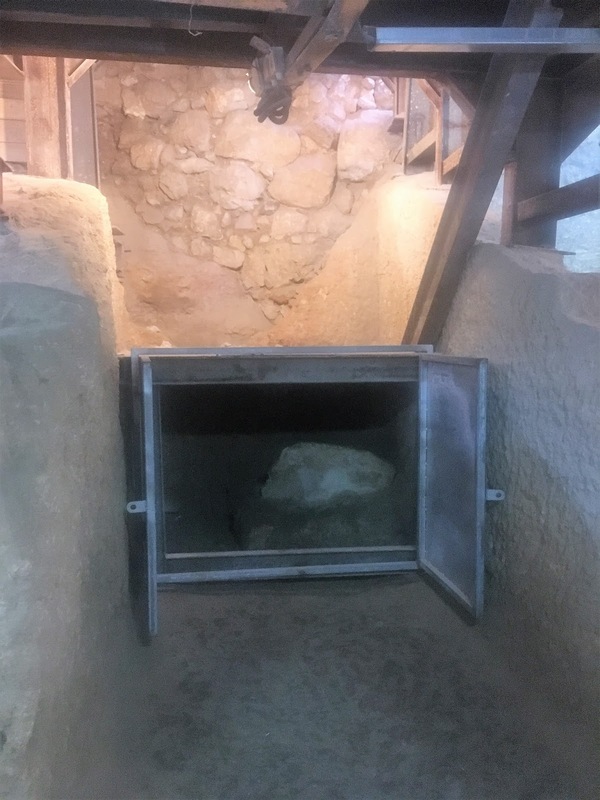 On the high ridge at G the stone-cut, beam, oil press is juxtaposed with the undisturbed matzevah or massebah and rock frame (see matzevah image below) that was placed directly on the bedrock at some point after the stone-cut rooms had been completed. Dating of the rooms carved on the high ridge could be as far back as Early Bronze IV such that the development chronology on the mountain may resemble the following. 5. Middle Bronze IIB-C 1750-1550 B.C.E. 6. Late Bronze I – 1550-1400 B.C.E. 7. Late Bronze IIA-B 1400-1200 B.C.E. 8. Iron Age I 1200-1000 B.C.E. 9. Iron Age II – 1000 – 586 B.C.E. At some point after the construction of rock-cut rooms at G, perhaps MBI or MBII the matzevah discovered by Shukron would have been constructed on the bedrock at G.
The significant rock-cut and matzevah features in the chambers at G indicate, at least MB use as a temple for high volume worship. Its large scale construction on the high ridge overlooking the Kidron Valley once announced its importance. The scant population of Mount Moriah cannot be have motivated such a significant rock-cut construction, therefore it is more likely it's location and cultural importance attracted people from the region that motivated its construction. Given the dominant nature of this early element of the scheme in Figure 3 especially its relationship to the southern end, it is surprising that the Rock-cut Pool and MFC cut the eastern slope, obfuscating access to area G's rock-cut rooms. Curiously the next Figure 5 scheme of excavation presents corridor 1,2 and 3. We have discussed corridor 1 previously as the east-west disconnected P-G corridor marked XVIII in Figure 3. However, corridor 2 terminates at the western deep cut edge of the Rock-cut pool and corridor 3 terminates prematurely into an apparent dead-end. The evidence suggests access to the water below from the temple on the high ridge at G was important. 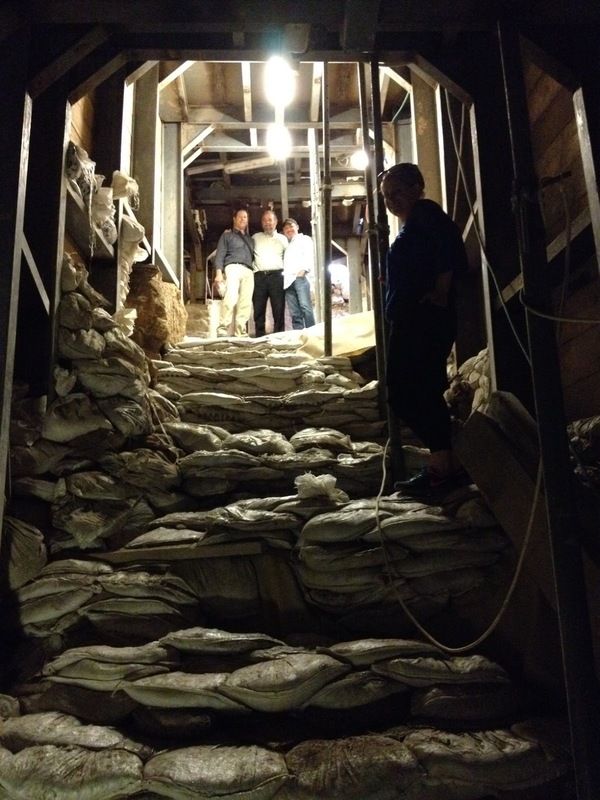 As demand for access was growing additional corridor excavation may have been undertaken. Nevertheless, these excavations are incomplete and 1,2,3 defined here as corridors may simply follow the bedrock slope to their termination points. 3. the MFC adjacent to the Gihon Spring was undertaken. 1. That Mount Moriah was settled in accordance with 1-3 of the chronology above during EB. 2. That MB I reasons for permanent settlement began to materialize, but that these were not fundamentally based on demand for water, but on soft-cultural, spiritual demands as evidenced by Geva's population estimates. Finally the reason for MFC and Rock-Cut-Pool were entirely geo-political, they served little practical purpose. At least the MFC and eventually the Rock-Cut-Pool was entirely required by regional leaders to cut the eastern slope and access to the Bronze Age temple on the high ridge at area G. The next video supports my claim.